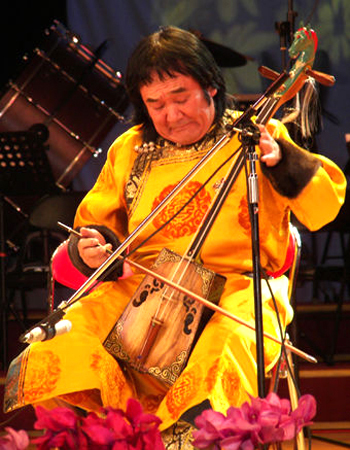 Či Bulag (b.1944) has had a significant influence on the development of the Mongolian morin huur in the post-Mao era. Bulag adapted the morin huur and its repertoire to the concert stage in the 1970s and 1980s to widespread acclaim. An analysis of his well-known and frequently played composition Wan ma benteng (Ten thousand galloping horses) and his efforts to adapt the morin huur to the concert stage shows how he reworked stereotypes of Mongols as simplistic nomads to represent them as both powerful descendants of Genghis Khan and participants in the modern world. While many Mongols appreciate Wan ma benteng for its evocation of a Mongol spirit, Bulag’s morin huur model has received harsh criticism from the musical community in independent Mongolia as being too Chinese. Mongol musicians in China have increasingly used the morin huur to balance their longing for a Western-style modernity, a project undertaken by Bulag, with recent desires to seek out a pan-Mongol (and non-Chinese) past through exchanges with the nation of Mongolia. Still, Mongol musicians continue to orient themselves around the work of Či Bulag as they debate the appropriate direction for the morin huur and Mongol music in the 21st century. This according to “Driving change, sparking debate: Chi Bulag and the morin huur in Inner Mongolia, China” by Charlotte D’Evelyn (Yearbook for traditional music XLVI  pp. 89–113). Below, Wan ma benteng in a performance by Bulag and ten thousand galloping students.